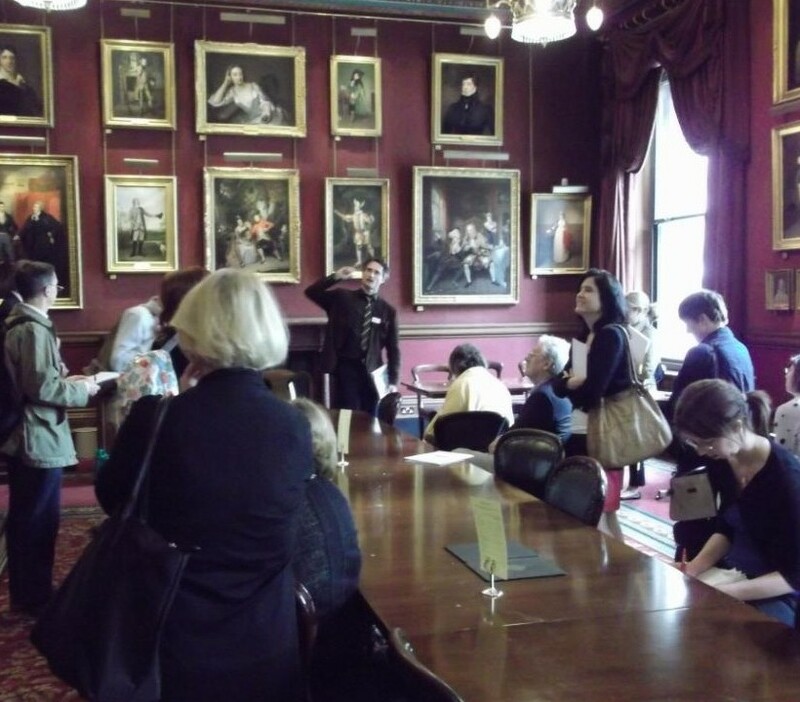 This event comprised expert-led tours of three rich portrait collections in London with musical and theatrical themes. They included visits to the Garrick Club in Covent Garden, the Handel House Museum, and the Royal Academy of Music in Marylebone. Please see the document below for a little more information on the nature of the collections, and further references. The Garrick is home to a remarkably rich portrait collection depicting the history of British theatre and stage performance. Since its foundation in 1831, when it was named in honour of the legendary actor David Garrick (1717—1779), the Club has provided a social hub for actors, writers and theatrical patrons. The portrait collection has been formed through a combination of bequests and gifts from Club members, and includes works by Hayman, Zoffany, Roubiliac, Lawrence, Millais and Edward Brian Seago. 25 Brook Street was home to the baroque composer George Frideric Handel from 1723 until his death in 1759. The Handel House Trust has meticulously restored the interior to evoke its appearance in Handel’s day. The portrait collection ‘peoples’ the house with Handel’s musical contemporaries, such as his patron Charles Jennens by Thomas Hudson c.1744, Handel’s leading soprano Anna Maria Strada del Pò, and the composer Richard Leveridge after Kneller. Delegates will also see the magnificent oval portrait of Handel in an unusual gilded frame of carved bulrushes, on loan from the Royal Collection. The Royal Academy of Music’s portrait collection depicts musicians, performers, and composers of the eighteenth to twenty-first centuries, many of them former students or teachers at the RAM. Delegates viewed the key works from the collection which hang in the Academy’s main concert hall, including portraits of the child prodigy William Crotch by Sir William Beechey (1785), the brothers Samuel and Charles Wesley by John Russell, Julia Neilson-Terry by John Collier (1892) and Sir David Lumsden by Jeff Stultiens (1993).